One of Defoe’s numerous political pamphlets, this work seeks to put a positive spin on Tory politician Robert Harley’s negotiation of the Treaty of Utrecht with France in 1713, which ended the War of the Spanish Succession. The “White Staff” is a reference to the official symbol of the office of Lord High Treasurer, the position held by Harley until his resignation in 1714. Harley had secured Defoe’s release from prison in 1703, after which he was employed by the government to write favorably about the Tories. Published anonymously, this pamphlet largely failed to sway public opinion since Defoe or Harley were presumed to have written it. The stylistic and narrative devices used by Defoe in this pamphlet have been interpreted by scholars as indicative of his shift from non-fiction writing to fiction novels. 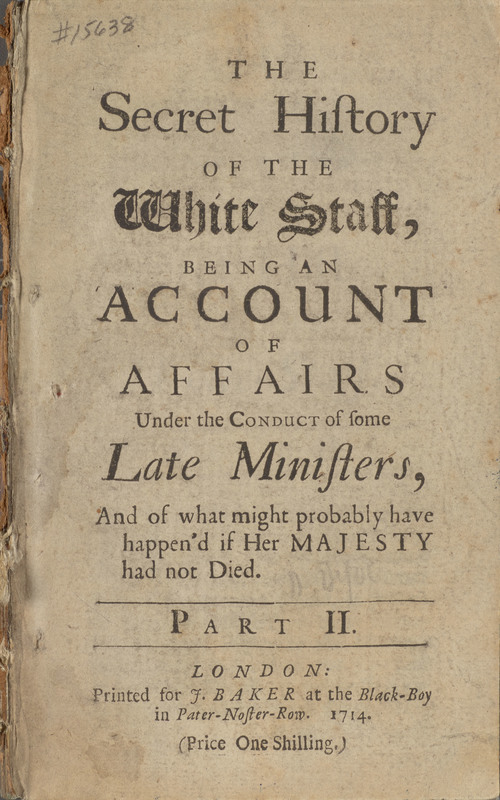 The Secret History of the White Staff: Being an Account of Affairs Under the Conduct of Some Late Ministers, and of What Might Probably Have Happen'd if Her Majesty Had Not Died. Part II. London: [J. Baker], 1714.